Northern Stage celebrated the fifth year of its New Works Now play festival in January. This year, the premiere of a piece by a current Dartmouth student opened the festival. Stephanie Everett ’19 wrote and performed her one-person play “It’s Fine, I’m Fine” on Jan.19 for a crowd of about 240 people. The play, heavily autobiographical, focuses on a former athlete forced to give up playing her sport due to brain injury. Everett is a sociology modified with African and African American studies major and theater minor. She participated in the theater department’s experiential term, or “E-Term,” this fall at Northern Stage, working in sales and marketing. The E-Term was started in 2016 and allows Dartmouth students to gain valuable professional theater experience by working at Northern Stage for a term. Carol Dunne, a professor at the College as well as artistic director of Northern Stage, was instrumental in creating the program. Dunne, who is adamant that all E-Term participants work on “passion projects” during their time with Northern Stage, worked closely with Everett. In addition to writing and starring in “It’s Fine, I’m Fine,” Everett also performed in the Northern Stage production of “Disney’s The Little Mermaid” as Adella, one of Ariel’s sisters. Dunne noted that Everett’s nerves related to performing alongside a professional company made her eager to work hard and prove herself. Dunne said that those at Northern Stage encouraged Everett to keep writing by providing deadlines for pages. “We told her that we don’t expect anything, but we want you to write,” Dunne said. The end result was a 55-minute play revolving around the plights of an everyday college student grappling with a history of concussions. The play also grapples with the unique experiences of Dartmouth students. 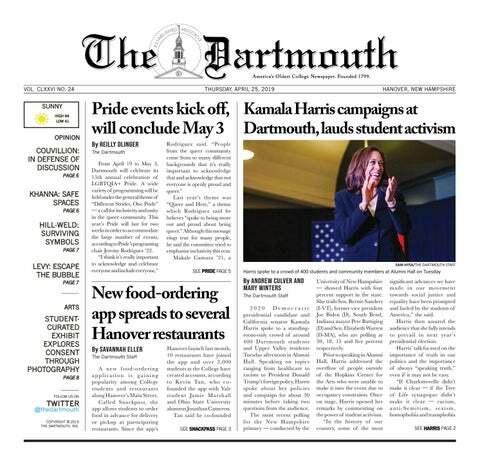 “At a place like Dartmouth, we’re obviously pushed to our limits, but now my limits are much lower than they used to be,” Everett said. When Dunne first heard portions of Everett’s play, she remembers the room of Northern Stage staff members being overcome with emotion. Everett never imagined that “It’s Fine, I’m Fine” would be selected for New Works Now. According to the playwright, the festival receives about 150 submissions for three spots every year from graduate students and already produced regional playwrights. The Northern Stage website stipulates that the festival only takes submissions by invitation. Everett shared the first 25 minutes of her play in the last few days of her internship and she received an email from Dunne a few days later asking to consider entering it for consideration. Dunne believes the overall message of the piece is what made it so important to produce. “I think the notion [Everett] has that everyone you look at is going through things you couldn’t impossibly know and that we should treat each other with compassion is what I responded to within the piece,” Dunne said. If anything, Everett wants audience members and students to gain a sense of strength from hearing her story and seeing her piece. Now, Everett is back on campus performing with the Decibelles and in the winter mainstage show, “1984.” Dunne is excited to see what Everett will accomplish within the theater department moving forward from this experience.